You are currently browsing the tag archive for the ‘Medicaid expansion’ tag. Frandal Wright, who went 27 years without health insurance before getting HIP 2.0 coverage last year, makes his $1 monthly payment at the Wal-Mart in Anderson. Because the store is on the other side of Anderson from where he lives, Wright tries to pay as much as he can at each visit to minimize the number of times he has to make the trip. Right now, he says, he’s trying to find someone to give him a ride to make his payment and determine if he has enough money to make a lump sum payment. Do Indiana’s poor Medicaid recipients really have skin in the game? As I viewed my electricity bill today I was told by Alabama Power “You pay on average $5 a day for your electricity.” This means I have “skin in the game.” I have the power to determine if I pay nothing per day or $20 per day. Well, only a little as it turns out. It seems that Alabama Power won’t let me come off the grid easily, so I will end up paying something no matter what. Also, my major non-air conditioner power usage corresponds to my use of the clothes dryer. I can minimize the use of the dryer by hanging a clothesline, I suppose, but elect not to. What I have decided is that I cannot do without electricity. So, although I have skin in the game, I can’t say “no, thank you, I’m using a cheap alternative to electricity so go away Alabama Power.” I rely on the Public Service Commission to negotiate fair rates and rely on the government to force my appliances to become energy efficient. Oddly, as appliances become more energy efficient, rates per kilowatt hour tend to go up. I now have less skin in the game (using efficient appliances less frequently still costs the same because I pay more per kilowatt hour) but still reflexively try to use less electricity. Modern life is confusing at times. [M]any of Medicaid’s enrollment and eligibility policies, which might make perfect sense for certain vulnerable populations, are not always appropriate for able-bodied adults possessing different capabilities and earning potential. Able-bodied adults need coverage, but not the same set of policy protections. One of the precepts of President Lyndon Johnson’s War on Poverty, from which Medicaid arose, is that government assistance should exist to provide a temporary pathway for people to lift themselves out of poverty toward a state of self-sufficiency. HIP respects the dignity of each member by setting a fair expectation of personal investment and engagement in his or her own well-being. Contributions are a way for members to demonstrate personal responsibility, but they also encourage members to stay engaged with their health plan, providers, and overall personal health. Because HIP Plus members’ own dollars are at stake, they have “skin in the game” and therefore an incentive to make cost-conscious health care decisions. 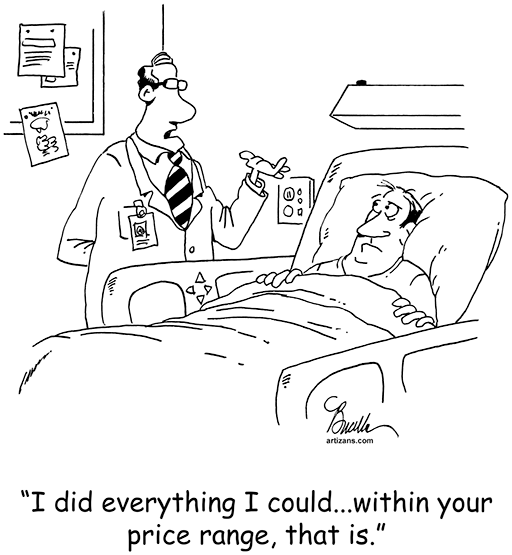 Well, maybe not…Turns out that for “frequent flyers” hospitals are seeing to it that the $1 premium is being paid. Because, if you miss a payment, you are kicked out. So it does seem that someone has skin in the game, just maybe not the patient. As a pragmatist, I believe that the motive is unimportant if the desired result is achieved. Results to date are mixed. Ms Varma points out that those who have paid their premium continuously (folks with “skin in the game”) are more likely to have a primary care doctor, less likely to go to the ED, and more satisfied with their care. Critics point out that enrollment is not by any means what it should be as many folks can’t get a monthly ride to pay their dollar. Also, less that half of folks who were enrolled knew that they even HAD a health savings account much less how to use it. As they say, further study is needed. In my professional experience, people believe they are healthy until they are sick. A monthly trip to Walmart to pay a dollar is likely not to change that. I hope that we choose to look at real measures of health and not try to do social engineering with our healthcare dollars. Uwe Rheinhart, a noted health economist, was asked to predict what would become of healthcare under Trump leadership. He said “My hunch is that the “replace” in what is coming will reflect that conservative vision. It is bound to spell more hardship for the poor, the old, and the sick.” I am afraid that that is what “skin in the game” means. My wife is reading (or listening to, I can never tell which) a book about “private life” (called At Home). One of the vignettes is about the development of safe drinking water. The central character in this story was John Snow, a physician living in London in the time of cholera (temporally in the 1850s). The legend is that using a map (this was the first documented use of a map to determine the source of an outbreak, very cool stuff) he plotted the cholera deaths and placed them proximate to a fresh water concern on Broad Street. He attempted to get the local government to act on his theory that the water pump was contaminated and the cause of the outbreak. Convincing the authorities (the local Board of Guardians) to remove the handle, he is credited with stopping the outbreak (or at least preventing a resurgence in the neighborhood). A couple of things about this story. First, Doctor Snow had lived through a previous outbreak of cholera several years earlier, and as a consequence he was unconvinced of the prevailing theory that miasma (bad air) caused the disease. His theory, that the disease was limited to the gastrointestinal tract and death was caused exclusively by dehydration, was consider not a little kooky. He was working on very little evidence as the existence of a cholera organism, though described in Florence roughly at the same time, was unknown to physicians in London. Robert Koch, the man who really put germs on the map as causative agents of disease, would not develop his postulates until 30 years later. Doctor Snow, it turns out, was looking for an opportunity to test his theory, and the St James Parish outbreak happened to have everything he needed (water contaminated with sewage with little competition from clean water and so delicious that people knew of pump by name, people who were dying of cholera at a fast clip, and a Board that was willing to try new things out of a sense of responsibility to their parishioners). As luck would have it, the water was VERY contaminated (wash water from an infected baby’s diapers and fresh water kinda mingled right where the pump intake was) and so the intervention was successful. John Snow lives on as a medical hero. Not everyone bought into the “drinking water causes disease” meme for a couple of reasons. First, miasma as a cause of disease had a lot going for it. If God made things smell bad, it must be for a reason, amirite? Second, because bad smells and disease tended to intersect where poor people lived, bad things must be happening to “bad people.” The slums were filled with people moving from the countryside during the Industrial Revolution, people who “were not nice people.” Therefore, in the Victorian age “the miasmas that seemed so prevalent among the poor slums were seen as God’s punishment for immoral lifestyle.” Over time, the sanitarian won and, by first building sanitary sewers and providing drinking water and later providing vaccinations, outbreaks of diseases like cholera and polio were conquered. So, in this country we are heading into our own Broad Street Pump moment. 26 states have elected to take full advantage of the Affordable Care Act, including expanding Medicaid to those who make below 138% of poverty as a sole qualifying criteria. In these states, Medicaid rolls have grown by 8%. This means that more than 3 million adults will have the security afforded by knowing they are not one illness away from bankruptcy. They will have access to care for complaints such as “blood in my stool” which would have gotten them triaged out of an emergency room before but now, under the right circumstances, a colonoscopy to find and cure their colon cancer. They will get treatment for bladder infections, pneumonias, and cellulitises without needed to get so sick as to require hospitalization. 24 states, including Alabama, have not expanded.Their rolls have expanded by 1%. These folks are mostly working, some at several jobs. They are using their common sense to tell them when to seek expensive care. I f they guess right, bankruptcy and an opportunity continue to work and pay off medical bills. If they guess wrong, death from a preventable illness. Meanwhile many, including public officials, are convinced that they are uninsured because they are undeserving. So, who will be our John Snow? Who will look at those dying from a lack of access in states like Alabama and say enough? How many deaths from preventable conditions will it take? Anyone know how to use Google Maps?